Buddy Holly and the Crickets British Concert Poster (1958). Buddy Holly toured the U. K. in March, 1958, changing the face of popular music forever. John Lennon was, at that time, a teenager obsessed with Buddy and the songs he heard playing late night on Radio Luxembourg. John wasn't able to attend any of Buddy's shows, but both he and Paul McCartney caught one of Holly's British "telly" performances, which left a lasting impression on both lads and their future careers. Holly's first stop of the tour, was the Trocadero in Southwark, a beautiful old theater which was since torn down. The band played for a scant twenty minutes, to a crowd of about 4,500 fans. This poster for that show is one of two known designs, and measures approximately 39.5" x 30". There is some light overprinting on the paper which "ghosts" the image in reverse, and there is one small missing piece in the upper left corner, away from the image area. It's been professionally mounted and framed, to an overall size of 43.75" x 33.75". 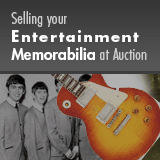 Own a piece of Rock history with this outstanding item!